Denmark have already set themselves up as the favourites to win Group D in the Euro 2020 qualifiers ahead of Ireland. But another nation who have been an regular opponent for the Republic in recent seasons, Georgia, believe that they are closing the gap on Ireland and are close to a first-ever win over the Republic. Yesterday’s draw put Ireland in a group against familiar faces such as Switzerland (five games in 16 years), Denmark (five games in 11 years), Georgia (third successive group pairing) and Gibraltar (games in Euro 2016). The managers are all of a similar age, between 55 and 65 so they know the score and they all know Ireland. Danish boss Age Hareide didn’t attend the draw but his No. 2, Jon Dahl Tomasson, says his side are ready for another attempt to try and open up Ireland, with three of the last four meetings ending in a 0-0 draw. “It’s funny that we are drawn again against Ireland. I think we have had a couple of difficult games where Ireland were defending very, very well; they did a really good job and made it difficult for us. But we are positive about our own strengths and qualities,” he said. 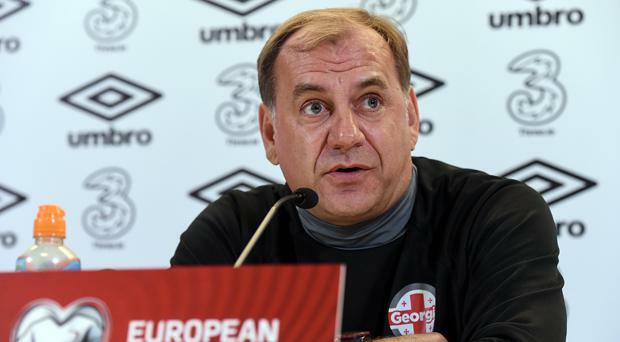 Georgia have lost eight of their nine games against Ireland, but the side coached by Vladimir Weiss have picked up form. “It’s time to win against Ireland, for the first time in history I hope,” Weiss said at the draw in Dublin yesterday. Swiss boss Vladimir Petkovic saw his side beaten on their last trip to Dublin, a friendly in 2016, and he’s wary of Ireland despite recent woes. “They don’t concede a lot of goals and I remember when we played against them it was very hard to score against them and we didn’t succeed in the end. That will be the focus now, to try and score against this strong defending team,” Petkovic said. Gibraltar coach Julio Cesar Ribas accepts his side are the group minnows but is boosted by decent Nations League form. “It’s very important because it gives you the possibility to get into a competitive rhythm you need for international football,” he said.